The New Fire Cable Power Plus usb power cable replaces your HDMI streaming devices power cable, eliminating the need for a power outlet. Giving you fresh wireless clean media center clean wireless media center setup. Instantly gets rid of the hanging wires from your flat screen TV. 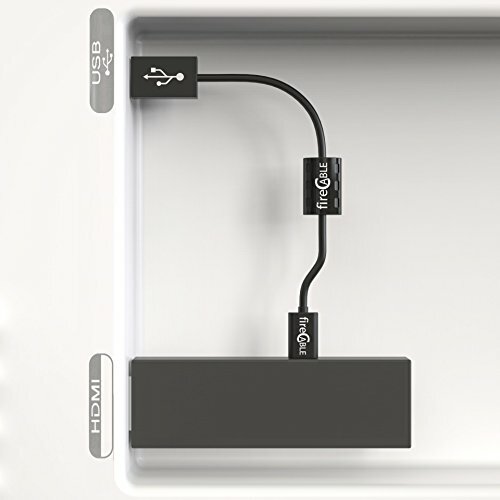 Fire Cable Power Plus was designed for ALL HDMI streaming media devices including Fire TV Stick & other Streaming Sticks and devices providing a constant flow of power from your TV's USB port directly to your Fire TV Stick. Click Add to Cart, to get your Fire Cable Power Plus Right Now! ✅ UNIVERSALLY COMPATIBLE with ALL STREAMING TV STICKS (IMPORTANT! New 2017 Fire Stick NOT Compatible with this usb power cable) All other Devices ARE compatible Including: Firestick , Google Chromecast , Roku Streaming Stick and ANY other HDMI streaming stick. Works with both new & old flatscreen TV's (your TV must have a USB port). ✅ COMPATIBLE with EVEN MORE TV's (older & new) Newly designed home theater system accessory, the thick, high gauge cable proprietary design, consistently delivers the perfect amount of power to your device for smooth limitless playback. ✅ EASY INSTALL Just plug it in, done! Now stream on. Perfect accessory to hide cables on your TV wall mount setup / flat screen TVs. Fire Cable Power Plus makes an excellent add on for your home theater system & it's great for travel! ✅DELIVERS CONSISTENT POWER SUPPLY TV USB output must be at least 1amp, some TV's will not supply enough power, money back guarantee if Power Plus doesn't 100% work with your TV. Power Plus is a thicker, high gauge cable provides consistent power which makes it compatible with a larger & is durable for longevity to your streaming device. If you have any questions about this product by GuideLine Pro, contact us by completing and submitting the form below. If you are looking for a specif part number, please include it with your message.